Buying a Holiday Home vs Going on Holiday – What are the Benefits? Buying a holiday home vs going on holiday is one of those debates that’s been raging on for years – and a lot of the time, it’s down to personal taste. But here at Silver Bay, we’re all about buying your very own slice of paradise; a place that you can return to time and time again and know for certain that you’re going to have a brilliant trip. But this isn’t the only benefit to owning a holiday home as opposed to going on holiday. Let us delve a little deeper into the exciting world of holiday homes and help you discover exactly what you can expect if you choose to purchase a property instead of a two week holiday the next time you want to get away! When it comes to going on holiday, you go and have an amazing two weeks and then come home again – but with a holiday home you can rest assured that not only can you have an amazing break, you can also be happy that you have an investment in your hands too. Holiday homes are a great way to pass on property in your family, and you can also sell them on too if you decide to eventually move on. Here at Silver Bay, our properties come with a 50-year lease – that’s much higher than most similar holiday properties in the area. Take a look at our options here. When you go on holiday, you’re very much heading into someone else’s turf. And although that sometimes can be an enjoyable experience, there’s something quite great and comforting about getting away to something familiar. When you have a holiday home, you can have it however you like. You get to plan the design, the ornaments and whatever else you like so it’s suited entirely to your personal taste. You can also make sure it’s always stocked up with your favourite things to really make you feel at home each time you visit. Perfect! When you go on holiday you have to fork our for numerous things including flights, accommodation, and whatever else you need – which quickly adds up in terms of cost. This isn’t true if you have a holiday home. You get the chance to take last minute trips for cheap, especially when your property is in the UK, and they’re also great for getting away for a weekend break without having to pay loads. All you need to do is pack a bag and throw everyone in the car and you’re off! 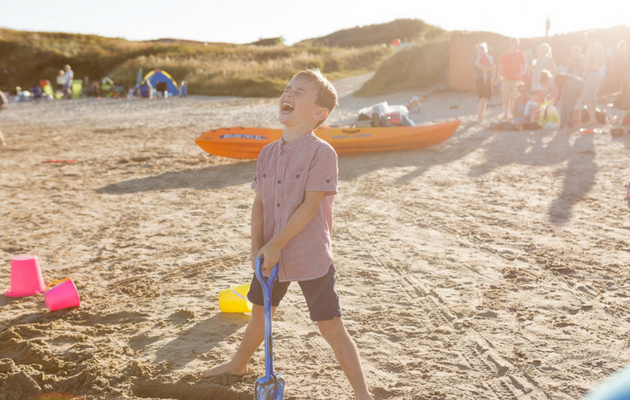 It’s that simple – which is one of the main things our residents adore about owning property on our holiday park. You can make great friends whilst going on holiday for a couple of weeks, but nothing quite beats the sense of community you get from owning a holiday home. You’ll find the same people around when you visit, allowing you and your children to make friends that you can interact with the next time you visit too. In this way, you get to holiday with friends when you go away, as well as having someone to relax and have fun with at resident gatherings such as the parties we have here at Silver Bay! When people go on holiday you’re bound to have access to certain amenities, but when you own your own holiday home you know you’re going to get everything you want each and every time you visit. This means you get to avoid any nasty surprises such as the pool being too small or the beach being miles away. At Silver Bay, our pool is brand new, and our private beach is close to hand – perfect for those lazy summer days. Don’t miss out. As well as amenities that may not always be what you thought, if you go to a hotel, your room might not be either. It’s happened to all of us, that strange smell that won’t go away, or that weird noise you keep hearing in the middle of the night and can’t figure out what it is. The area you’re staying in could also be questionable if you’re new to the area and leave you feeling unsafe. This won’t happen with a holiday home. Our gated community is the perfect place for you and your family to relax and have some fun. You also get to visit our park before you buy if you’re interested in joining our community to get a taste of what we’re all about – so there’ll be no nasty surprises upon arrival. You’ll know exactly how amazing Silver Bay is before you leave your home! When on holiday, you’ll find all outdoor space is usually communal. This means you have to share and can’t dine alfresco in peace and private. Here at Silver Bay this isn’t the case. Most of our properties come with decking, and these are great places to relax outdoors with room to manoeuvre for just your family or company – perfect! You can rest assured your holiday home will be private. Even our caravans are spaced out to avoid that ‘packed in’ feel you get from some holiday parks. If you go on holiday, the likelihood is you’re going to have one bedroom for your family, two at a push – and they quickly get cramped. But here at Silver Bay you can ensure you invest in a property that has plenty of room for all of your family. You’ll get more bedrooms, an ensuite bathroom, a kitchen, dining room and much more. It’ll feel more like a home than a hotel ever could – perfect for an excellent break for everyone. What do you think? Intrigued to find out more about our holiday homes? Take a look here at our wonderful collection. We also have a fantastic e-brochure you can download. If your interest is piqued and you’d like to see what a day would be like in one of our very own Reef lodges would be like, take a look here at this blog entry. Silver Bay is a family friendly holiday park that everyone’s sure to love. So what are you waiting for? Call us on 01407 860 111 to discover more and speak to our friendly staff! There are a lot of essential components required to create the perfect holiday home, and here at Silver Bay we’ve refined our holiday home lodges to ensure that our customers get access to only the very best accommodation around. But what is it that makes a perfect UK holiday home? First and foremost, for a holiday home to work it has to be somewhere that’s truly special. Luckily for us, Anglesey is one of those places. With the Welsh mountains and beautiful coastline both close by, you can be sure you’ll have access to some amazing views no matter which way you look. These views set the tone for the whole holiday park, and they provide a relaxing place where all the family can happily unwind together. When people think of holiday homes, they usually think about spending glorious hours soaking up the sun. Yet whilst we do have sunny weather in Anglesey through the summer months, what many people seem to forget about is just how beautiful autumn, winter and spring can be when you’re surrounded by nature. Embrace the beauty of all seasons at Silver Bay, and you’ll soon realise you can holiday in the UK no matter what time of year it is. Although we appreciate beauty can be found away from beaches, we have to say we’re immensely proud of the Silver Bay private beach available to our lodge owners. Access is only available to residents, and we also have a boat park so that if you’d like to sail or dock your boat at Silver Bay the options are there. It truly is a slice of paradise – and the beauty of the Anglesey coastline shines through for all our residents to enjoy. All the family will have fun on Silver Bay beach – and so will any pets too! With each and every holiday home we’ve created, we always ensure that the finer details are refined to perfection. This means making sure that the lighting is perfect with the likes of the soft lighting in our ‘Reef’ properties, as well as including fully integrated kitchen appliances that are sure to impress. It’s these little design quirks that make our holiday homes truly spectacular. When it comes to our suites, we really like to make a big statement. One of our favourites is the bi-fold panoramic doors that come with our ‘The Reef’ property. These doors sweep one side of the building with floor to ceiling glass, and they look magnificent. As they are doors, they can also be opened to let the warm weather in during the summer months, and they really do offer a slice of holiday home luxury for all our homeowners. Nobody wants a tiny holiday home, that’s why here at Silver Bay we make sure there’s lots of room for everyone. Our ‘Reef’ lodge in particular comes with three bedrooms that are very spacious. Every member of the family will be satisfied with their bedrooms and living space after they’ve explored what ‘The Reef’ has to offer. 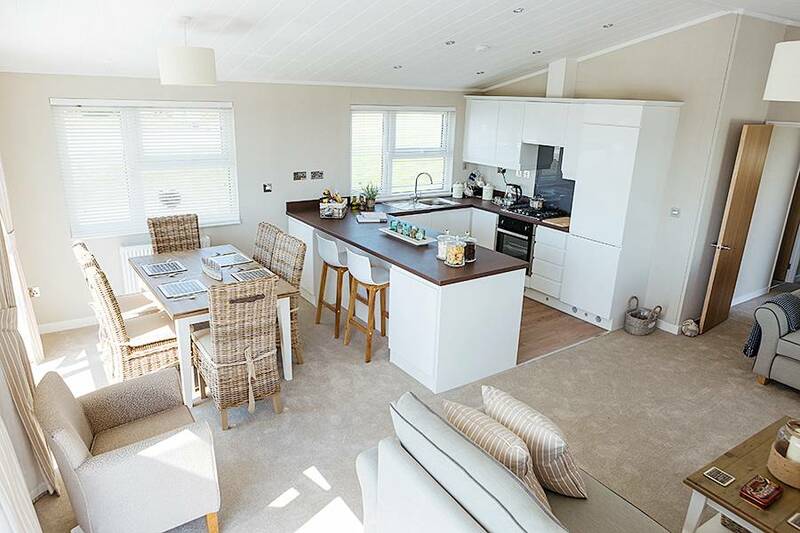 If you’re after a holiday home with plenty of room, you won’t go wrong with Silver Bay. 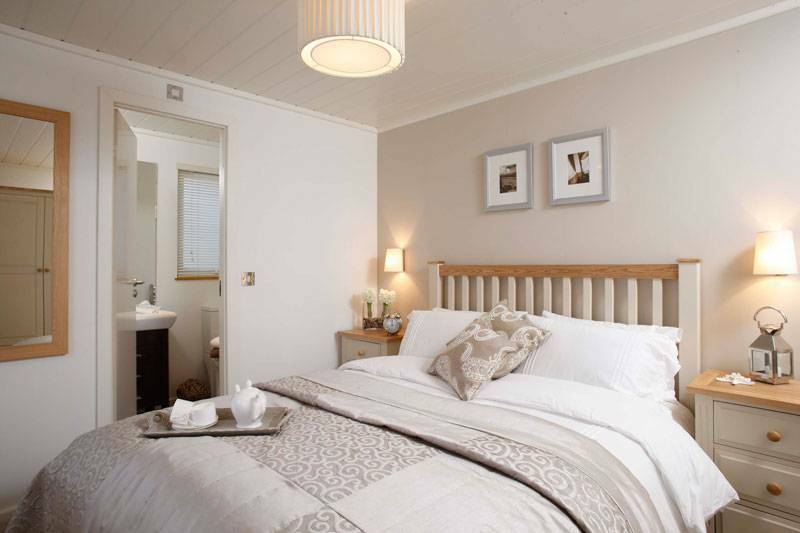 When you have a holiday home, you want it to look the part – so that’s what we offer at Silver Bay. Our refined furnishings matched alongside our beautiful bathroom suites and stunning kitchens will make sure you feel at home, whilst also providing you with some magic holiday home touches. We pride ourselves on offering beautiful furnishings that will impress and inspire anyone who walks through your holiday home doors – so why not what see what we have available for you and your loved ones? The great thing about Silver Bay is that there’s so much outdoor space you won’t know what to do with yourself – and some of our lodges even come with their own private areas. Our ‘Reef’ property in particular has a section of decking so you can relax outdoors in the sun. However, even if your holiday home doesn’t have any private outdoor space, you can be sure you won’t feel left out. The vast open space surrounding Silver Bay alongside the beach are enough to keep anyone satisfied. So why not make the most of what Anglesey has to offer with a holiday home at Silver Bay? If you’re interested in purchasing a holiday home at Silver Bay then why not get in touch today? We have a new development in production right now, and we also have some fantastic properties already built just waiting for new owners. To find out more, call us on 01407 860111. You can also take a look at our e-brochure here.